The obvious two best cards included here are Path to Exile and Rest in Peace, and I’ll gladly pimp out my Zur deck further by adding those in (he already has the Jace spellbook cards that I could use in the deck as well). Blackblade Reforged is a great sword that I have in my voltron deck so that one will get used as well. I too believe that I have True Conviction in a deck or two, so I’ll find a spot for it. Otherwise, there are some edge cases here. I don’t see myself using the Planeswalker. Worship, Martyr’s Bond and Shielded by Faith are fine, but not great. I still rather enjoy the artwork, and sometimes you sit on cards like these for a while and then end up finding a use for them. It also means that I’m getting extra copies of cards that I can use in future builds, so I definitely see the value in this product and can’t wait to see who they give the treatment to next. I assume for black we’ll get Liliana, Chandra for Red and Nissa for Green, but there are so many cool spells that we’ll get new artwork for I’m sure it will be worth it. Maybe not worth the wait though! A couple of interesting tidbits hit news feeds in the past couple of weeks. There hasn’t been the official “big product road map announcement” for this year just yet, but three sets have been confirmed. We already know about Core Set 2020 due out in the summer, and the next normal set to round out the Ravnica and Gatewatch story, War of the Spark. We can also assume there will be a Commander 2019 product, but otherwise the rest of the releases for 2019 are unknown. So when we heard what I’m about to talk about, there was some excitement to be had! The Cabal Therapist is definitely a modern focused card. I don’t really see many EDH applications unless you’re doing a lot of “show me your hand” effects to really make use of this creature’s ability. Still a pretty decent card. The Serra Planeswalker is a pretty cool idea, taking a card we’ve known since the beginning and giving it a legendary treatment. It actually looks like a great fit in Kaalia or other Angel EDH decks, just because it’s pretty on theme and can keep you in the game if you get targeted. The set it supposed to release within the next couple of months, and it appears to be the Modern Masters replacement. I hope it brings some powerful cards. The other big news was concerning the next expansion, War of the Spark. 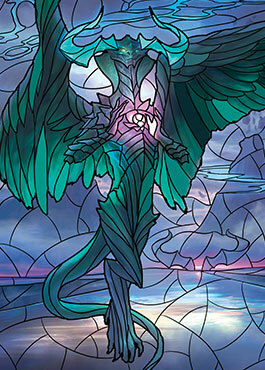 There was a teaser video that showed a bunch of Planeswalkers done up as stained glass windows not too long ago, and then WotC told us that every single one of those Planeswalkers will be present in the new set. Unfortunately they will not look this cool — they specifically said that the stained glass art would not be on the cards in the set. However, there were a total of 36 given this treatment, and it turns out that all of them are cards we’ve seen before. It’s unclear if there will be reprints or new versions, but they did say that there will be a Planeswalker in every pack, much like there were legendaries in Dominaria. I’m torn on the idea. Planeswalkers were supposed to be something you only saw here and there, are are less likely to see play unless they fit a deck’s theme or you’re running superfriends. Some are very powerful — I’m sure most of you playing Arena are sick of seeing Teferi, Hero of Dominaria over and over. I think stuffing this many into a set could take away some of the magic that makes Planeswalkers special. I guess we’ll have to wait and see what happens there. This set is supposed to be out next month, so spoilers will be coming soon enough. I’ll be covering that as soon as it happens. 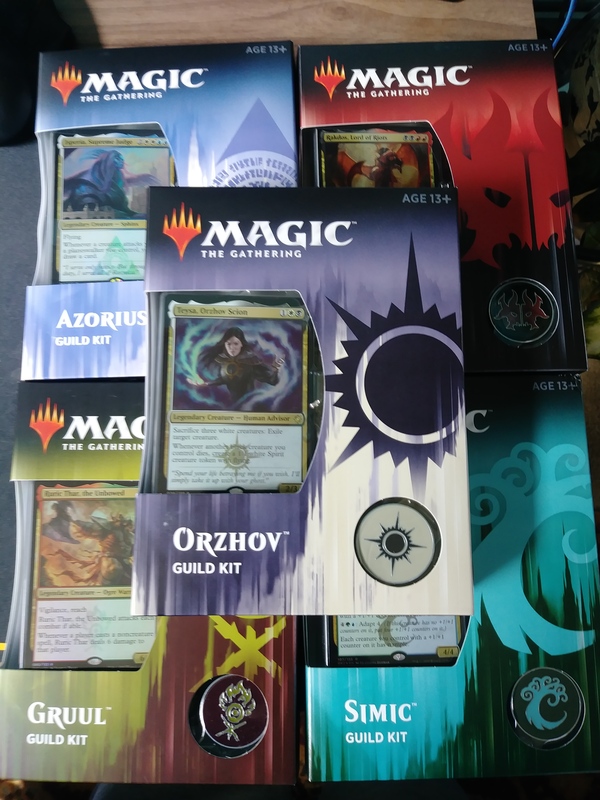 It was announced with Ravnica: Allegiance that shortly after the release of the set we’d see guild kits for the next five corresponding guilds. This happened with Guilds of Ravnica as well, where the other five guilds got their own guild kits. For whatever reason I wasn’t too keen on picking those up, but the new color pairings had more I was interested in. The guild kits are a neat little package. 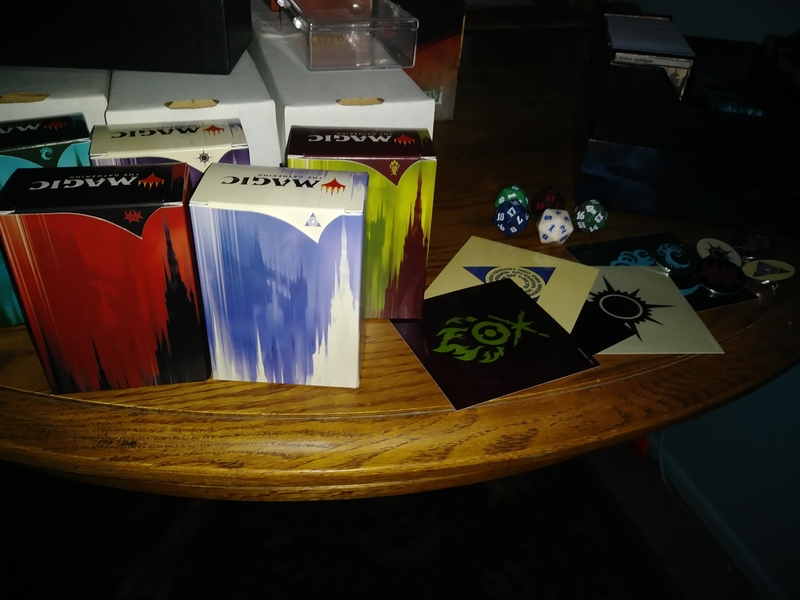 Each comes with a two color 60 card deck containing reprints of cards from the other two Ravnica blocks along with some inclusions from the current set. Also packed in are deck boxes, dice, pins and stickers featuring that guild’s logo and a foil alternate art version of a previously released Legendary creature. I decided to pick up a bundle of all five that I got for a good deal on Amazon, and they arrived a couple of days ago. Pictured above, you can see the alternate art cards along with the pins. I really wanted to grab these because there are a ton of cool reprints that aren’t necessarily expensive to get singles of, but I like the alternate art cards, and the extra accessories are a nice added bonus. I’m not going to go into specifics about the full deck lists, but there are a few cards I wanted to highlight just because they are awesome additions to my collection and/or cards I had on my wishlist. You can however see the full decklists here. First of all, the new basic lands with the guild themed artwork are amazing. These can be spread about multiple EDH decks as most don’t use that many basic lands. Next, there are the cycles of signets, charms, and keyrunes that are great additions to any collection as they will be used in multiple decks. The new alternate art generals are great too, plus foil so they can replace non-foil versions if you already have them, or can just get you an extra copy for another deck. The following are some cards that I felt deserved a few words, but that doesn’t mean these are the only useful cards in these decks. They just seem to be cards that I think I’ll find a use for in existing decks and projects. Isperia, Supreme Judge. Isperia is an Azorius Sphinx, and there are plenty of these to be found throughout Magic’s history. 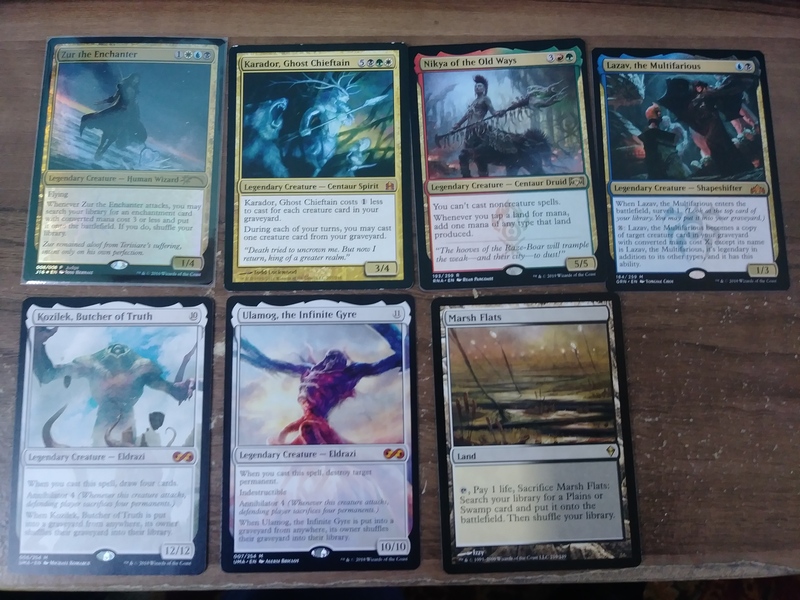 I actually brewed an EDH deck around Sphinxes but next got around to building it. Perhaps with the additional ammo that has come from recent sets I may revisit the idea. Either way, this card is at home in control and pillowfort decks that want to discourage you from being attacked. I’m not sure I’d use this card as my general, probably opting for Azor, the Lawbringer instead, but Isperia would still hold a place in the 99. Rakdos, Lord of Riots. I already have this version of Rakdos in my Kaalia deck, and just want this alternate art foil to replace the basic version. I do think that I can find a place for this extra copy though. Ruric Thar, the Unbowed. I brewed a Gruul deck not that long ago and Ruric was part of the 99. He’s a beast of a creature and I think he’d even make a swell general, but I’m going to throw him into that deck for now. Teysa, Orzhov Scion. The older version of Teysa is still pretty damn good, and seems to be a viable addition to the newer Teysa deck that I brewed recently. I think that I’ll try it out, if not I think she might slot into the Daxos token deck I am working on. Further testing needed. Zegana, Utopian Speaker. This is the only alternate art foil that’s actually a new card and not a reprint. This card released with the new set, and given that my merfolk deck is simic, this card slots right in. The +1/+1 counter shenanigans were already a part of that deck but that part of the strategy keeps getting bolstered so I’m going to roll with it. Not sure what I’m going to cut at this point, but I’ll figure it out. Ghost Council of Orzhova. I like this card for my Oloro lifegain deck. It could work with Aminatou’s blinking theme too, but I think it fits Oloro better. I’ve thought about buying this card for a while, so now I finally have it. Dovescape. Another great control card in Azorius colors, but could also be something I throw into my Estrid stax deck just for additional control if needed — this sounds like it could work well particularly if I get her chain veil and plus ability combo going for big mana. I should be able to flood my board with tokens. Pontiff of Blight. I love the extort ability, and this guy gives all of your creatures extort. Not sure where I’ll put him, but it’s going somewhere for sure. Debtors’ Knell. A great reanimator card, I’ve included this in several brews without owning a copy. Now I do. Master of Cruelties. I have a copy of this guy in my Kaalia deck, and he can put in some work, along with being able to cheat around his limitation of attacking alone. I think I’ll easily find another deck that can use him. Birds of Paradise. Surprisingly enough, I don’t own a copy of this card, and it’s a staple mana dork. I’ll have this in a deck quickly. Zhur-Taa Druid. Another mana dork that does some damage while giving you mana. It seems likely to find a place in a deck. Borborygmos. This guy just looks like a solid beater that can give out counters. In a deck that cares about counters in these colors, it’s a great way to get ahead. Protean Hulk. Too bad he’s banned in EDH. The things I could do with this guy. Vorel of the Hull Clade. I’ve wanted a copy of Vorel for a long while now. He’s got an interesting ability that let’s you double up counters on a creature, artifact or land. This obviously works best with creatures, but there are edge cases to be made. Being a merfolk, I think I’ll be slotting him into my merfolk deck just to be able to do more with +1/+1 counters. Momir Vig, Simic Visionary. He’s kind of like the older version of Prime Speaker Vannifar. They both let you do some tutoring but do so in different ways. I’m not sure what I’ll do with him, but he’s an interesting card. Perhaps a new deck is in order. Simic Ascendancy. This is one of those alternate wincons that rarely work but are kind of like an achievement if you can get it to. I think I might put this in my merfolk deck, unless I find another deck better suited for it. That’s all I wanted to highlight today. If you like any of these particular color combinations I’d recommend grabbing that guild kit, because the value you’ll get is worth more than the asking price. I love getting a good deal on ways to bolster my collection, because the brewing is endless in this household.